The Portland Timbers head to Seattle on Thursday with a chance to advance to the MLS Cup Western Conference finals for the third time in eight seasons. Knocking out the rival Sounders would make such an accomplishment extra special. Portland players understand that even with a 2-1 lead in the two-match, aggregate goals playoff they will be up against a significant challenge at CenturyLink Field. Both teams found reason to be pleased with Sunday's result. The Sounders scored an away goal and trail only by one with 90 home-field minutes ahead. The Timbers got to celebrate a home win over Seattle. The second match is Thursday instead of Sunday (because the four-day Seattle International Auto Show opens Friday). It will be Portland's fourth game in 12 days. Seattle, thanks to its knockout-round bye, is playing its third game in that span. "It's unfortunate we have to play on a Thursday. But these are the conditions, and we have to be ready to battle," Timbers coach Giovanni Savarese says. "Our team, usually in hard moments, becomes even stronger." Seattle center back Chad Marshall (knee) and playmaking Cristian Roldan (groin) left with injuries in the first half of Sunday's match, which could make the shorter turnaround between games more of a challenge for the Sounders. Marshall is the veteran rock in the back line, and Roldan is a sneaky dangerous midfielder who played all but seven minutes of the regular season. He thrives when opponents pay too much attention to Nicolas Lodeiro. "Not only is (Roldan) a good player, he brings a lot of energy to their team," Savarese notes. "It was tough for them to lose not only him but Marshall as well." Timbers fans, of course, never will feel sympathy for the Sounders. Portland fans know how injuries can derail a season — as they did for Portland last year, when injuries to Diego Chara, Sebastian Blanco, Fanendo Adi, Vytas and Darren Mattocks ruined Portland's chances in the conference semis against an inferior Houston team. The Timbers players won't complain publicly about the schedule. But I will. It's a bad look for MLS that this match isn't on Sunday, when the other three conference semifinals wrap up. And, for all the drama of the Portland-Seattle rivalry, fatigued players don't perform at their best. But such is life as a secondary tenant (ask Portland State about Providence Park). Soccer fans can hope that someday MLS and its television partners get the power and/or gumption to prevent these schedule hurdles — for example, by forcing a team in the Sounders' situation to play the second game of a two-leg series on the road and the first at home. Whining aside, Thursday should be a compelling scene in Seattle. At stake is a spot in the Western Conference final against Sporting Kansas City or Real Salt Lake (tied 1-1 after Sunday's match in Utah). 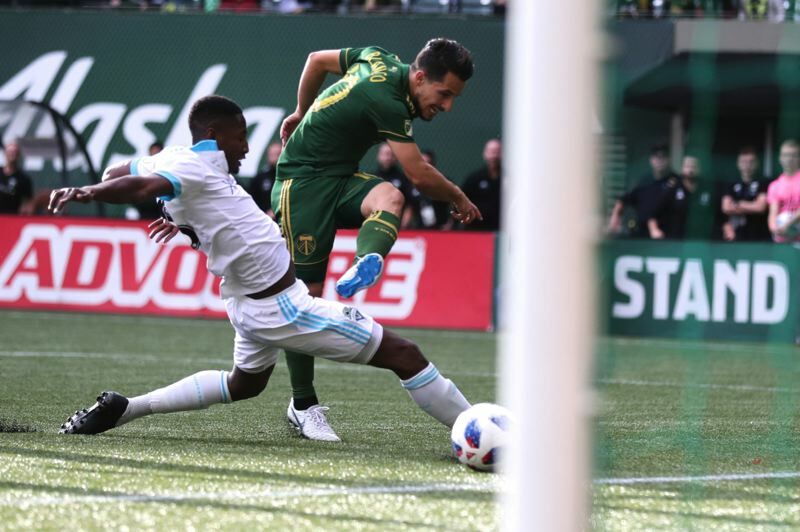 Portland's 2-1 win on Sunday means the Timbers need only a draw on Thursday to advance. If Seattle wins 1-0 on Thursday, the Sounders go through based on the away goal tiebreaker. If Seattle wins 2-1 on Thursday, an extra 30 minutes will be played. And, if the series score remains tied, penalty kicks will decide who moves to the conference finals. If Portland scores two or more goals on Thursday, the Sounders need to win by at least two (4-2, 5-3, etc. ), because the Timbers would own the away goals tiebreaker. So the Timbers could really turn up the heat by scoring first. Not that Portland can't come from behind — though Sunday's turn of events was only the second time this season Portland has come from behind to win a match. Savarese's side is playing well at precisely the right time. It's hardly a surprise to see Valeri step up the way he did in the two playoff wins last week — though it should not be taken for granted. But to watch Jeremy Ebobisse grow into a confident striker and to see Bill Tuiloma play a big role on defense was nice. Entering this series, one clear advantage for Seattle was the striker position. Peruvian Raul Ruidiaz scored 10 goals in 14 matches after joining Seattle at midseason, spurring the Sounders' climb from the basement of the conference to second place. He demonstrated his talent in the 10th minute by putting the Sounders ahead. Then came the response — from Ebobisse, Portland's 21-year-old who played in 18 United Soccer League games for Timbers 2 this season and nine games in MLS. His perfectly timed run onto an exquisite Valeri pass created a one-on-one with Seattle goalkeeper Stefan Frei that Ebobisse cooly chipped over the onrushing keeper. "As soon as I got the ball in behind I took a look and saw Frei rushing out and I knew that the best way was to get it up and over him," Ebobisse said. "The final touch was definitely instinctual, but there's a lot of preparation that goes into that split second." Valeri smiled broadly in talking about the goal and the bright future for Ebobisse's upside. "He deserves that (goal)," Valeri said. "He's a great professional. A mature guy, a very good teammate. He's capable to be a different class player. So I think if he keeps working and we support him, I think he's a national team player." For now, the player the Timbers traded up to grab in the 2017 MLS SuperDraft not only has a bright future but a big present if the Timbers are to continue their playoff run. Another bright spot on Sunday was Tuiloma. The 23-year-old New Zealander started alongside Liam Ridgewell because Larrys Mabiala was suspended. Tuiloma, who has played midfield and defense in his career, played in 13 MLS regular-season games this season. He clearly embraced the opportunity to play against Seattle and to defend the talented Ruidiaz. "It was amazing," Tuiloma said, crediting Ridgewell's vocal leadership for helping him feel comfortable. "I just kept calm and played my game." Mabiala figures to return for Thursday's match, so Tuiloma might have to wait for his next big chance. But he's earned the confidence of his teammates. "He plays a great long ball, he's very physical in the air and he has a good calming presence about him," goalkeeper Jeff Attinella says. "His ability to play the ball with his feet and especially spray the long ball is something that brings a different element to our team. He played a great game. He had a big task, and he did really well with it." The task remains sizable for Attinella and his mates. But the Timbers have been on task of late. Last Wednesday, they pulled off a gutsy elimination-game win at FC Dallas, despite playing most of the second half down a man after Mabiala's red card. With Sunday's victory over Seattle, the Timbers have won their last four meaningful matches by a combined 11-3. • There is another meaningful game on Thursday: The USL Cup championship (5 p.m. PT, ESPN2). It will be the last game for Chelsea and Ivory Coast legend Didier Drogba as Phoenix Rising FC, the team that beat Timbers 2 to open the playoffs, take on a Louisville City team shooting for a repeat title.